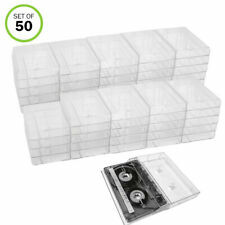 Evelots Cassette Tape Cases-Clear Plastic Storage-Audio-No Scratch/Dirt-Set/50. Evelots DVD-Blu Ray-Video-Storage Bag-Clear-Handle-Hold 80 Total-Black Top-Set/2. Item: DVD Storage Case 40 Sleeves. Color/Design: Black [80 Sleeves]. 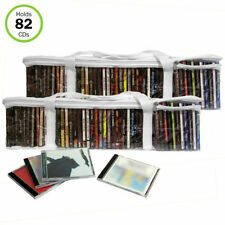 Fashionable case holds 40 CDs or DVDs. Condition: New. Schellack Schutzhüllen aus Folie: 270x270 Typ 100. Farbe: Klar. Die Hüllen sind glasklar, nicht so milchig wie die Standard PE Hüllen. Karton Zuschnitte9. Schallplatten Hüllen559. Die Hüllen sind aus einer sehr stabilen und hoch transparenten CPP Folie. This is for a lot of two. The darker one does have a little chunk out of the rear backside corner of the wood that goes against the wall, quite minor and only stated for accuracy. Anker Colour Monitor Cassette / Tape Storage Case. Probably a very rare if not lone survivor. Vinyl model of a TV monitor, perfect for storing tapes. isr ecycled whenever possible to help reduce costs. Dim: 5.7"h X 6.98"w X 6.38"d. Protects your valuable CDs in non-woven polypropylene sleeves. This four DVD case is the size of a standard width single case. Capacity: 4 disc per case. Utilizes a push hub to hold discs. Case ONLY, no discs included. Holds 36 standard sized cassette tape cases. Designed for cassette tapes. Wall mountable or free standing. Good overall condition with small signs of wear from storage and normal use. Felt Lined. Holds 45 CDs. Cd Rack has normal scuffs and scratches from previous use. Perfectly designed for your car or travel, the Discgear Discus 40 features a compact design that fits in small spaces. This patented design protects 40 discs including Blu-Ray. Capacity: 40 discs. The scratchproof pockets will gently cradle your discs. 9 Vintage Napa Valley Cassette Crate Holder W/Tapes. Condition is Used. Shipped with USPS Parcel Select ground. Comes with 25 cassette tapes great condition. 2 Caselogic CD Holders. Both in good overall condition. Normal use scratches/smudges/dust/etc. # columns with 15 slots per, bottom slot can hold 2 cases or a double CD case. This is for a lot of two. Very cool VHS holder with 2 drawers and slots for 24 tapes. Faux wood finish has a chipped corner and a pen doodle on the back. Holds 36 Tapes. Study Wood Trim with Vinyl Walnut. Its efficient, space-saving design provides maximum DVD storage, CD storage, and BLU-RAY storage in a minimal amount of space. 52-DVD/Blu-Ray Disc tower. USEFULNESS: Holds up to 52 CDs or Blue ray discs. Vintage Jimi Hendrix Napa Valley Box Co Wooden Cassette Tape Storage Holder. Holds 20 cassettes. Please review photos as it is missing 1 divider. Neues AngebotPre-Owned Case Logic CD/DVD Carrying Leather Wallet Holds 128 CD's! International and other rates may apply to out of US-48. Stapelbare Aufbewahrungsbox. voll funktionstüchtig. Archiv Hard Case. 5 NEW White VHS Tape Storage Cases Clamshell W Sleeves with Hub RARE WHITE OK! Lot of 5 NEW Black VHS Tape Storage Cases Empty Clamshell W Sleeves with Hub OK! Rare white! Never used. Napa Valley Box Company Wooden Hinged Cassette Holder 3 Crates Tabletop Storage. Really nice storage box, in very good pre-owned condition. There are light signs of wear, but no major defects. Three drawers that each fit 12 cassettes (36 total). Holds 45 CD's. Great condition! No breaks or cracks. All sides and corners pictured. 2 Ikea Lerberg DVD Regale. Anthrazit, bzw. leichte Gebrauchs-, bzw. Abnutzungsspuren, wie Farbkratzer. auch für Blu-Rays und teilweise für CD´s verwendbar. The zippers were checked and work correctly. The back has 2 holes that are 16” apart so that the holder can be wall mounted. Brand New 8 x 6 Inch White Cardboard CD/DVD Mailers With Flap & Seal. Lightweight, affordable, easy to use, ideal for mailing photos tablet screen protectors etc. Stay Flat Rigid Mailer. Perforated Tab For Easy Opening. 100 pieces total. .
One of these is a rarer round logo version. Be sure to see the photos. Evelots Cassette Tape Cases-Clear Plastic Storage-Audio-No Scratch/Dirt-Set/25. 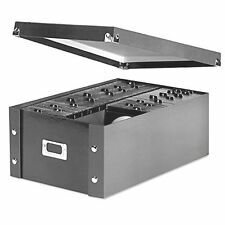 Here is a Discgear Selector 100 storage box for CDs, DVDs, and Blu-Ray discs without jewel cases. This has plastic protectors for three pages of index sheets, but only two are filled (the two together are numbered 1 to 100). There are zippers on each side that hold 36 on each side. All zippers were checked and work correctly. Very cool little AV decor collector. A vintage cassette storage box, please note at the back of one of the drawers some plastic tabs have broken off, it still hold the cassette in place. 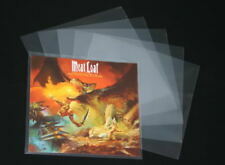 Clear flexible CPP plastic CD sleeve or pocket. Excellent for storing CDs or DVDs more efficiently, where space saving is important. Quality you can trust! Capacity: 1 disc per sleeve. VINTAGE NAPA VALLEY WOOD 36 CT CASSETTE TAPE WALL MOUNT CASE L@@K!!!! Neues AngebotVintage Faux Wood 36 Cassette Tape Holder 3 Drawer Storage Case Organizer CLEAN! This is really clean & quality made. No deep scratches, gouges, dents or dings anywhere. Only a tiny part of the laminate has started to peel up a bit on the bottom. This is on the very bottom (underside) back corner as seen in the 5th photo. One empty plastic, 8mm reel can included. The reel can has a "HANDI SPLICE" 8mm splicing block molded into the lid, for regular 8 and Super 8 film splicing. Location: 10 F 3 entire brown box.